We have now looked at a number of ways in which matter can be grouped, such as into metals, semi-metals and non-metals; electrical conductors and insulators, and thermal conductors and insulators. One way in which we can further group metals, is to divide them into those that are magnetic and those that are non-magnetic. Magnetism is a force that certain kinds of objects, which are called 'magnetic' objects, can exert on each other without physically touching. A magnetic object is surrounded by a magnetic 'field' that gets weaker as one moves further away from the object. A metal is said to be ferromagnetic if it can be magnetised (i.e. made into a magnet). If you hold a magnet very close to a metal object, it may happen that its own electrical field will be induced and the object becomes magnetic. Some metals keep their magnetism for longer than others. Look at iron and steel for example. Iron loses its magnetism quite quickly if it is taken away from the magnet. Steel on the other hand will stay magnetic for a longer time. Steel is often used to make permanent magnets that can be used for a variety of purposes. Magnets are used to sort the metals in a scrap yard, in compasses to find direction, in the magnetic strips of video tapes and ATM cards where information must be stored, in computers and TV's, as well as in generators and electric motors. 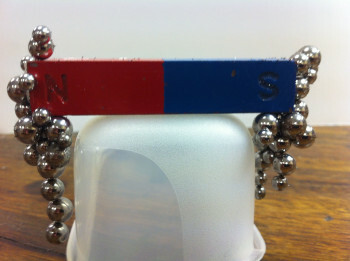 You can test whether an object is magnetic or not by holding another magnet close to it. If the object is attracted to the magnet, then it too is magnetic.